Sunday 27 November at Troinex saw two Meinier teams compete in the Swiss National Open Championships otherwise known as the Peppermill Challenge. This is the first time our Club has entered the competition but we have been working towards participating at this event for some time. We are proud to have had 21 Meinier girls and women take the court on the day and so many others including Dads, brothers and friends helping and supporting as coaches, umpires and fans. Our 2nd team played some great netball and their enthusiasm for the game shone through their smiles and the fun they had together. The team comprised mothers and daughters, sisters, twin sisters and of course good friends – many of whom began playing Netball only this season. Meinier 2 came 8th overall from 9 teams. 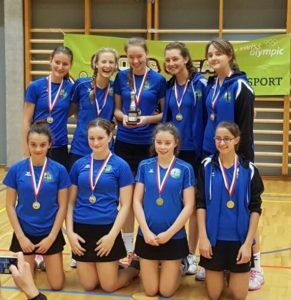 Well done et bravo Meinier 2 ! Our 1st team provided us with a consistent display of outstanding netball throughout the day. Their dedication to training, fitness and hard work all through this season was evident to everyone there. The standards these young players are achieving is highly impressive. Without losing a single match in the first rounds Meinier qualified in no.1 position for the semi – finals. So…. in a thrilling opening semi-final match, Meinier secured victory over GIN in the very last second – what pressure and what excitement – the crowd went wild as the final whistle sounded and the final goal went in for Meinier. 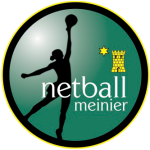 Heading to the final V GGNA , our Meinier team remained composed, structured and disciplined and executed a near perfect game plan and their eventual comfortable victory was well deserved.